The story of this well known and fondly remembered Hampshire operator has been recorded more fully elsewhere so the main focus of this present article is with regard to the bus routes that they operated in the post-war years by looking back at representative timetables. To set a historical context the operation was founded in the 19th century as a subsidiary of the once large Provincial system which had included tramways in Cardiff, Cleethorpes, Devonport and Portsmouth. The starting point was the Gosport ferry landing with its frequent and well patronised connections across the mouth of the harbour to the city of Portsmouth. Provincial started to run horse trams in Gosport in 1882 from the Ferry to Brockhurst along Elson Road, and the route was extended to Fareham station and electrified from January 1906. A second tram route to Bury Cross along Stoke Road started in October 1906. 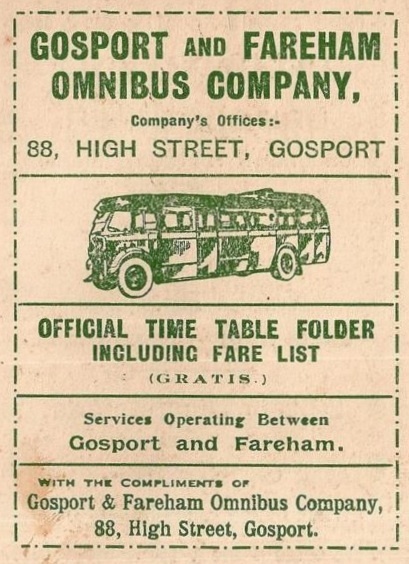 The last trams ran on 31st December 1929 after forty seven years and the company then changed its name to Gosport and Fareham Omnibus Company. Seven of the trams went to a nearby Provincial company - the Portsdown and Horndean Railway - who continued to run until the route was acquired and replaced with buses by Southdown in 1935. Buses had been tried before, and the company's trams had been under pressure from a number of competitive bus operators, mostly small enterprises with only one vehicle. The new Gosport and Fareham company started with a fleet of twenty six green and cream vehicles, of which nineteen were Chevrolets. These were based at the ex-tram depot at Hoeford which would continue to be the base of operations throughout the life of the company; whilst Gosport Ferry remained the hub of the bus services. The route network was growing with the main Fareham service extended to the then new West End estate, and other routes to Elson, Grange and Haslar. The mid-1930s saw the arrival of the first double-deckers. 1936 saw the appointment of H. Orme White as manager, a role he would occupy for the next thirty years. In 1939 the businesses of Blake and Price were acquired with their routes to Alverstoke and Stokes Bay. 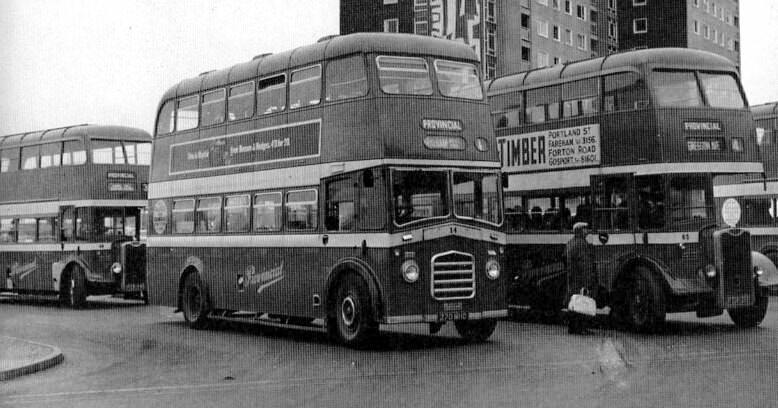 As the survivor of the old Provincial Tramways group the buses of the Gosport and Fareham company were restricted to a relatively small area of operations through limits imposed by statutory powers. Thus some vehicles were licensed to Provincial Traction to be able to operate outside those limits. Being in an area of strong naval presence, the company was to be hard pressed throughout the war with many service establishments in the operating area. At one point buses were loaned from London. To minimise the risk of damage many vehicles were dispersed and parked away from the depot overnight. Summer open-top operation was introduced on the 16 in 1951 and the 10 in 1952, the vehicles being conversions from within the existing fleet. In May 1953 the services and two routes (to Albemarle Avenue and to Kings Road) of J Dyer were acquired and this gave the company a monopoly of operation in their own area, excepting the long established Hants & Dorset interurban routes. Between them routes 1 and 3 between Gosport and Fareham gave a six minute frequency during the day. At the end of 1954, following the collapse of the Hants and Sussex operation a further route was introduced in replacement, the 17 from Fareham Market to Heathfield Estate and Catisfield. Before 1948 and the arrival of Hants & Sussex on the route it had been operated firstly by E Millard and then Glider & Blue. A final acquisition followed a few months later in February 1955, the route of F Smith of Funtley from Fareham to Knowle Hospital, and this was numbered 18. Here, as aroiund the country, the early to mid 1950s were to be the peak time for bus operations. 1957 was to be a year of signifance for the company as on 18th June fire broke out at Hoeford depot. Six buses were totally destroyed, four double deckers, a coach and a disused saloon bus. Two further buses had their bodywork destroyed. Eventually nine second hand double deckers were obtained to replace the losses. The manager Orme White now began to experiment with Deutz air-cooled engines and several successful conversions were made into the 1960s. June 1961 saw a new summer open-top route 8 from Bridgemary to Lee-on-the-Solent, and also a new 9 from Crossways and Brockhurst to Stokes Bay. From January 1967, following the retirement of Orme White at the age of 81, H H G Woollford took over as managing director, having served the previous year as deputy manager. Nine Seddon Pennine single deckers (40 seats plus 15 standing) were ordered to replace older vehicles and they arrived in July 1968. One man single decker operation was expanding to displace double deck crewed operation. 1968 was the last year for the summer season open toppers and in 1969 the company's first ever under-floor engined vehicles arrived, three Bristol LS6G coaches. Change was now in the air and in March 1969, Provincial as parent company of Gosport and Fareham, was taken over by the Wiles Group, which was soon renamed as the Swain Group. Independent operation came to an end soon after when on 1st January 1970 the bus operations were sold to the National Bus Company, and Hants and Dorset Motor Services would now administer the company, although retaining the Gosport and Fareham Omnibus Company name and leaf green livery. Woollford stood down as manager although operational control on a day to day basis remained at Hoeford and the Gosport and Fareham fleet continued to be operated as a separate unit with its own identity. Route and service reorganisations were implemented in the autumn of 1970 and the operation became primarily single-decked with Leyland Nationals coming into the fleet from 1972. Gosport bus station opened that year too. A further major change came in June 1980 with the launch of "New Provincial" as the local trading name. In the late 1980s after the deregulation of local buses by the 1985 Transport Act the company was bought from the NBC by its management and employees and then became "Peoples Provincial" from February 1987 under the leadership of James Freeman. Various vehicles were trialled from minibuses to a Routemaster (the latter in March 1987). Subsequently First Group acquired the company in the autumn of 1995, but this is now really beyond the compass of our intended look at independent bus operation! A detailed history 'Provincial - the Gosport and Fareham Story' was written by Patrick Miller and published in 1981 by TPC. ISBN 0903839 47 4. The Provincial Society was formed in 2003 to preserve the heritage of the operator. 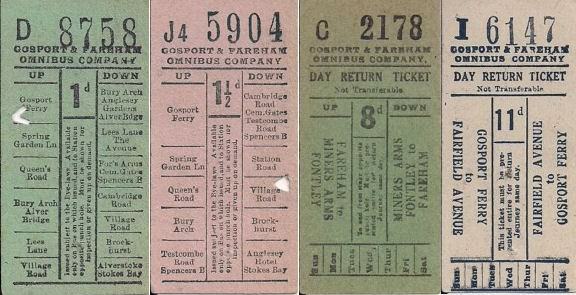 Their webpage here has an interesting history of Gosport's Buses and Trams.